Do liability risks outweigh the benefits of saving lives? That is the question a small device is bringing up for business owners, homeowners associations, public facility operators, and others. That small device causing the debate is an automated external defibrillator, or AED for short. The City of San Diego recently passed Ordinance #19820, which makes it one of the most progressive cities when it comes to AED legislation. However, does this ordinance increase costs and liability exposure for companies, organizations, and public facilities? Can a city ordinance or any government regulation help save lives? Is it really worth passing an ordinance over the use of AEDs? Every year about 220,000 people suffer cardiac arrest and only about 5 percent of them survive. Sudden cardiac arrest is usually caused by erratic electrical activity within the heart muscle which results in significantly decreased blood flow to the brain and other vital organs. Though cardiopulmonary resuscitation (CPR) can restore some blood flow, death usually occurs in a few minutes unless an electrical shock can be delivered to the heart in order to restore the natural heart rhythm. Ordinance #19820 contains language on the effectiveness of defibrillation: “defibrillation or shock using an automated external defibrillator (AED) is the only effective therapy for sudden cardiac arrest.” For each minute that passes without CPR and defibrillation, the chance of survival from sudden cardiac arrest decreases up to 10 percent. When sudden cardiac arrest happens, it is fatal to depend on the arrival of paramedics to save the victim. Eight to ten minutes or more will often pass from the time of a witnessed sudden cardiac arrest to the arrival of paramedics – this is far too much time to save the life of someone having this type of cardiac event. To put this in perspective, more people die each year from sudden cardiac arrest than die from breast cancer, prostate cancer, handguns, traffic accidents, house fires, and AIDS combined. Sudden cardiac arrest is a significant problem, and any device that can save lives is certainly worth having, using, and passing legislation over. Though the passing of Ordinance #19820 is a positive step in the right direction, there continues to be some resistance over the use of AEDs. This resistance is based on the concerns of increased costs and more liability exposure for property managers and owners. But, steps should be taken to comply with the law and to ensure easy access to AEDs. 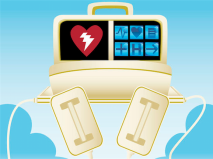 A PAD (Public Access Defibrillation Program) is designed to assist businesses and organizations in setting up the process of AED use at their facility. Here are a few highlights on the ordinance and the management of potential liability. Notify the County EMS Department of the location and type of every AED on the premises. To be in compliance, the business or organization responsible for the device must, at the time the device is acquired and placed, notify EMS. Become familiar with applicable codes, including California Health and safety Code Sections 1797.5, 1797.107, 1797.190, and 1797.196; and California Code of Regulations Title 22, Division 9, Chapter 1.8 Sections 100031 through 100040. Expected AED users/rescuers must complete a training course in cardiopulmonary resuscitation (CPR) and in use of the AED device. The AED Unit must be visually inspected on a monthly basis at minimum to ensure that it is in good working order. Each location must have a PAD (Public Access Defibrillation) Program Liaison This can be anyone you designate; they will maintain and perform the duties of PAD Program. Each location must have one CPR/AED certified person on the premises during normal business hours; certifications must be maintained. There should be a written plan in place that will describe the procedures to follow in case an AED is needed. The PAD program must be under the oversight of a Medical Director. The Director is usually supplied by the AED supplier. There is also a minimal annual fee paid to the physician who serves as the Director. The California Good Samaritan Law provides blanket liability protection to AED purchasers and users. Not all states have this comprehensive liability coverage, but it works well to protect those who attempt to save lives The law provides for immunity for Rescuers, immunity for Acquirers and Enablers, immunity for AED Trainers, and immunity for Medical Directors, The Good Samaritan Act, along with compliance with the procedures outlined above can minimize the risk of any potential liability. According to the American Heart Association, there have been no known legal judgments against the operator of an AED for improper or negligent use. In fact, the chance of liability or legal action may be greater for failing to have an AED available to treat a victim of sudden cardiac arrest. In a recent verdict in Florida, a jury found Busch Gardens negligent for not properly training its employees to provide emergency care. This included not having essential medical equipment, such as a defibrillator, on the premises..
Prices of this life-saving device have fallen recently, as does the price of most electronics. Prices range from under $1,000 to $1,500. There are also maintenance costs to consider, which usually run less than $200; this includes the fee for the Medical Director, the renewal of CPR certification, and replacement of AED batteries and pads. This is a small price to pay for saving lives! Though government red tape can sometimes be onerous, these small steps necessary to get in compliance with the PAD program and Ordinance #19820 are relatively easy. This new legislation only applies to new construction; the impact of the law will be minimal at first. However, the potential liability for not having an AED on site may spur property owners and managers to follow the new law and make sure that they are in compliance with the PAD program. The manageable costs of implementation and the live-saving benefits of having an AED on premises make a compelling argument for following the law and protecting everyone on the premises from the fatal consequences of sudden cardiac arrest.